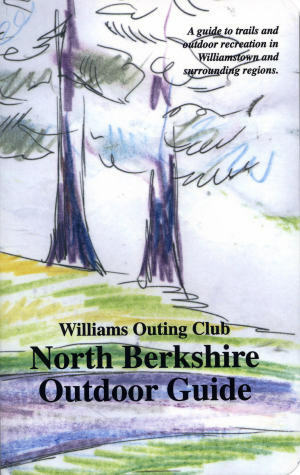 This is the 11th edition of the Outing Club’s comprehensive guide to the outdoor recreational opportunities in the area, updated in spring 2019 with the help of numerous volunteers in the Williams community. 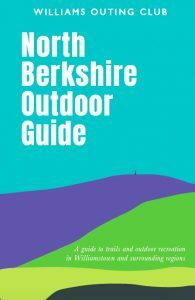 The guide includes an introduction to the Berkshire area, basic safety and preparation training, and an extensive list of trails and sections on hiking, fishing, climbing, paddling, and winter camping. A map of the North Berkshire Trails located inside the book’s back cover allows hikers to locate trailheads, camping areas, canoe put-ins, and fishing access points. The description of each trail includes a detailed route description with distance and estimated hiking time, map locations, and directions to the trailhead. The guide lists hotspots for various outdoor activities, including cross-country skiing, biking, fly-fishing, rock climbing, and paddling. It also has a directory of resources with gives the locations and contact information of outdoor-related retail stores and non-profit organizations. A sample of the map and a trail description for Pine Cobble is available for viewing. This guide to outdoor recreational opportunities in the Williamstown area also includes a topographical map of the area, showing all hiking trails.The guide with map are available in the WOC equipment room or WOC office for $20, map can be sold separately for $5! ALL mail orders should send a check for $22 to cover cost of shipping for guide w/map. You can also order the map separately for $6, which includes $1 shipping. You can also order the map separately for $6, which includes $1 shipping.